This report examines two groups of individuals who are inherently not well understood to Bay Area Bike Share and other public bikesharing operators: casual users and non-users (i.e., individuals who examine the system but choose not to use it). Using publicly available data from Bay Area Bike Share’s website, researchers conducted a preliminary analysis to determine when and where intercept surveyors should be stationed. Two survey instruments were tailored specifically to casual and non-users. 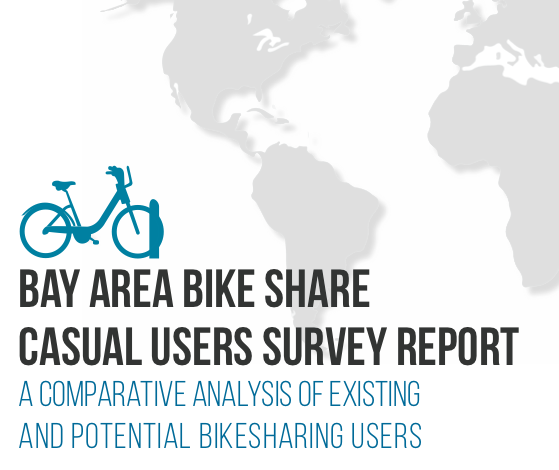 From the survey instruments, the researchers were able to glean information regarding demographics, socioeconomics, common trip purposes, reasons for choosing or not choosing to use Bay Area Bike Share, and other related data. Findings suggest that Bay Area Bike Share casual users are similar to annual members in educational attainment, income, and race but they differ in trip purpose, trip duration, and home city. Furthermore, researchers found that the majority of casual users did not fully understand the pricing structure, specifically relating to the fees applied to trips over 30 minutes. The pricing structure and the limited distribution of bikesharing stations were the two most frequently cited issues with the system by users and non-users. Overall, casual user satisfaction with BABS was relatively high.